Your keywords are a foundational element of your SEO and inbound marketing efforts-it's essential that you choose them wisely. This requires a strategic approach to your keyword research, and one that's different from building a paid search list. Get this critical first step right and you'll maximize both traffic and leads from your inbound campaigns. So how do you get started? 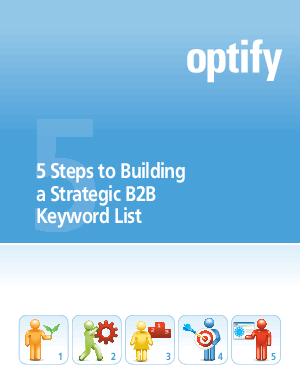 Get "5 Steps to Building a Strategic B2B Keyword List" to ensure that your SEO and inbound marketing efforts are built on a strategic keyword foundation.